Fire is an integral part of land management in northern Australia. Every year extensive prescribed burning programs are carried out. Burning during the cooler months to reduce fuel load decreases the risk of large fires that cause greater damage late in the season. Controlled burning also helps to maintain biodiversity and assists with vegetation management. The lasting effects and devastating impact a hot wildfire has on a community is well documented and takes years to recover from. HeliSpirit has a complete fire management package. 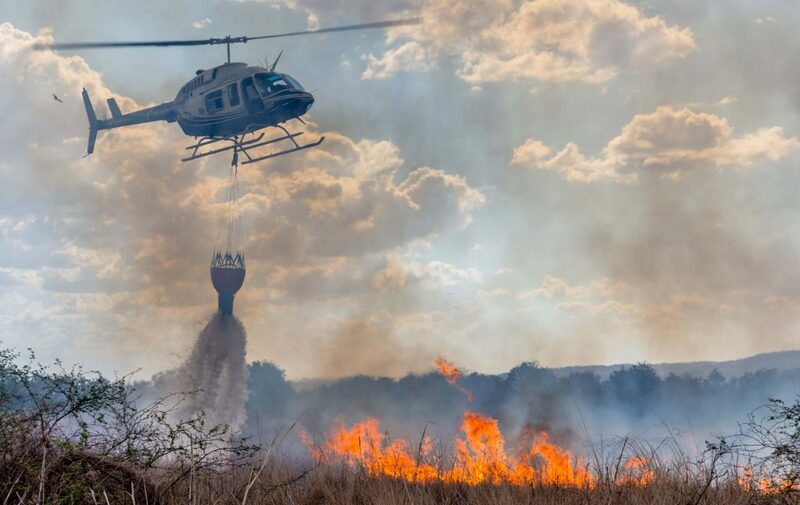 We have the capability to burn the fire breaks using our Robinson R44, slinging a drop-torch (“Spitsfire”) capable of igniting 30 nautical miles on one line. This builds effective fire breaks as wide or narrow as desired. For fire fighting, HeliSpirit has helicopters that specialise in fire suppression. Our Bell Long-Ranger with a Bambi fire fighting bucket can utilise water from any nearby water source.